John Stutts received a 50 acre Land Grant located on Dry Creek. Everet Smith and Nathan Smith were chain carriers. David Allison received a 590 acre Land Grant located South of Cabin Creek adjoining his own line, Thomas Grayham and Everet Smith?s improvement. John McDonald and Angus McIver were chain carriers. David Allison received a 343 acre Land Grant located on the fork of Bear Creek adjoining Everet Smith and his own line. Hezekiah Dunn and George Cagle were chain carriers. Everet Smith received a 100 acre Land Grant located North of Cabin Creek adjoining David Allison and his own line. Leonard Furr and Levy Smith were chain carriers. Leonard Furr received a 100 acre Land Grant located North of Bear Creek adjoining Needham and Everet Smith. George Cagle and Leonard Furr were chain carriers. Everett Smith was born in 1751, in Moore County, NC, lived for a while in Georgia before moving to Mississippi and settling on Fair River. He died in 1822, in Lawrence County, Miss., the part which became Lincoln in 1870. Among his children was, William Smith, known as "One Hand Bill." Some of the Smiths from both Moore and Montgomery Counties in North Carolina migrated to Georgia. Among them were Everett, Gabriel, Jesse, and William." DESCENDANTS OF CAPTAIN BILLY SMITH, by Gregory S. Smith. FURTHER EXPLANATION IS GIVEN ON PAGES ONE AND TWO OF THE BOOK. William Smith was born February 26, 1763, Moore county, North Carolina, enlisted for service in the Revolutionary War in 1780, in Ninety-Sixth District, South Carolina. After the War he lived in Moore and Montgomery Counties in North Carolina. The Patterson?s also migrated from Moore county, North Carolina. William Smith's wife was apparently Sarah, and they were involved in many land transactions in Franklin Co., Georgia, some of which involved the Kees Family. 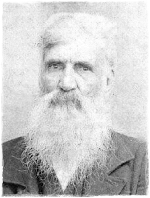 William Smith was probably a brother of Everett Smith, and is a likely candidate for the father of Captain Billy Smith." Per Gregory S. Smith.